Its a Mobile World. Your Website Should be Too. 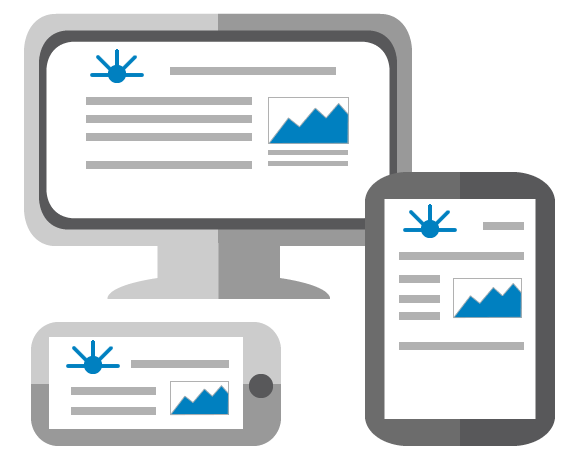 Responsive web design ensures your site will look good viewed on a desktop PC, a tablet or a mobile phone. Since the majority of traffic vi sting your website will most likely coming from a mobile device, your website needs to cater to this growing segment of traffic. Additionally, major search engines now favor sites that are mobile friendly in their ranking, which is another reason to have a responsive website. Web Mentors provides mobile friendly responsive web design. This site is one such example. Resize your browser window to see how this page layout responds to different page widths. Web Mentors is a full service eBusiness consultancy. We offer much more than websites and hosting. Our services include a variety of Technology Solutions that help businesses attract more customers and become more efficient and successful through automation. We use our expertise to deliver innovative solutions that increase drive results and generate profits. Working with us, clients are more agile in the marketplace and more successful at the end of the day, and that's really the bottom line. We want to see you succeed beyond your wildest imagination. Ten, twenty, a hundred-fold increase in whatever drives your business, that's where we want to take you. Are you ready? Web Mentors partners with companies who want to harness the power of technology to improve business. We believe the right technologies can improve efficiencies, drive results, open new markets and generate profits. Each customer is a unique opportunity and so is our approach. We never try to shoe horn you into a one-size-fits-all solution. Whether an eBusiness reorganization, interactive website, national marketing campaign, online inventory database, or other solution that will make you most successful we are your partner for success. And your success is why we go to work. Web Mentors provides comprehensive, end-to-end services to help businesses grow by harnessing the power of the Web. Our services include strategic direction, creative design, website development, website programming and all the other services necessary to be successful as an eBusiness. While our services maybe complex, you won't sweat the details (unless you want to) because we make it simple for our customers. It's not about the technology, its all about results: doing more with less time, effort and money. And results are what our services are designed to deliver. Determining the right mix of technology to apply to your business is a very important decision. While not all business problems can be solved with a technology solution, the list of proven solutions is growing. However, the balance is important since too much technology can divert cash flow, while too little technology is characterized by inefficiency and dull repetition. Rather than implementing disruptive changes in a business practice, technology should complement the business and enhance operations. Web Mentors goal is to eliminate inefficiencies in the operation with minimum disruption. A few key changes can help take a business from being marginally profitable to highly profitable. Web Mentors helps businesses grow by harnessing the power of the web. Is your web site capable of engaging your visitor or does it just sit there? Here is a sampling of the most popular features we can add to your site. Content Managed Pages Changing prices, phone numbers and specials are a fact of life. Our content management system makes updating your web simple as using a word processor. Account Login Password protected information to share with premium clients. The account includes a "forgot my password" reset and pages to update contact information. Online Forms Save time on each transaction by making your paperwork available online. Create wizards to calculate prices and generate quotes instantly. Your customers will appreciate having them conveniently available. Calendar of Events Promote upcoming events on your website and through email news letters. Combine with Account Login to allow choosing which events customers want notifications. Online Database Place your inventory or other information online 24/7 protected with the best security and encryption available. We provide methods for automatic updates so that customers are always looking at the most current information. Site Search Have a lot of information to share? Make it easy to sift with a search tool. You can exclude personal or private information from the search, even make information from other websites display in the search results. E-Commerce Your product inventory, pictures and pricing can be elegantly displayed in an online catalog. An easy to use shopping cart, shipment calculator and credit card authorization are all incorporated. Search Engine Optimization Ready to expand your market globally? We get your site noticed in search engines and drive traffic. There is a lot more to search engine optimization than placing a few keywords on a page. If you are not getting noticed, let us help. Document Library Do you want to share articles, case studies etc. your site? We provide a simple to manage and easy to use library so visitors find the documents they want. You can easily upload video, text and audio to your library. Multi-Language Pages Got something you want to share with the rest of the world? We make your pages available in any language you want. We also offer translation services to the most common languages (French, Italian, German, Spanish, Japanese, Chinese, etc.). Your web site is a 24/7 storefront, a virtual employee greeting your customers as they visit. Web Mentors wants the customer experience to be positive visiting your site. We provide massive network bandwidth, responsive servers and multi-layered security so your web site is always fast, available and secure. Web Mentors owns and manages our servers in a state-of-the-art data center located right near your customers. We use the latest network security technologies to protect against the ever growing threat of unauthorized access. We offer isolated storage that places critical data on separate servers. The result is the best engineered platform for deploying rich, dynamic sites able to cope with the most demanding traffic levels, ensuring a consistently high quality of service for your clients. Our services regularly undergo risk assessments and independent third party audits for verification. Need help setting up your email? No sweat, there are videos and step by step instructions for all the popular email readers. Michael Curry is your contact should you have questions about your website, hosting, email or just want to chew the fat. Click here to connect with him.